For the video game genre, see Strategy video game. For the card game, see Strategy (card game). The history of turn-based strategy games goes back to the times of ancient civilizations found in places such as Rome, Greece, Egypt, the Levant, and India. Many were played widely through their regions of origin, but only some are still played today. One such game is mancala, which may have originated in Samaria approximately 5000 years ago and has since diversified into scores of varieties worldwide. One form challenges two opposing players to clear their side of a board of mancala pieces while adding them into their opponent's side and thereby preventing the opponent from clearing their side. At each end of the game board in this version there is a larger pit in which each player must try to deposit the pieces to try and gain points. When one side is cleared the other side of the board's pieces are added to the cleared side's pile. This version of mancala can be played quite casually, but still presents strategy demands, e.g. to interfere in your opponent's playing area while clearing your own. Another game that has stood the test of time is chess. Chess is believed to have originated in India around the sixth century CE. The game spread to the west by trade, but chess gained social status and permanence more strongly than many other games. Chess became a game of skill and tactics often forcing the players to think two or three moves ahead of their opponent just to keep up. This game also became accepted by many as a proxy for intelligence; people who became grand masters were considered smart. The game portrays foot soldiers, knights, kings, queens, bishops, and rooks. Several portray actual positions in the historical European military. Each piece has a unique movement pattern. For example, the knight is constricted to moving in a L-shape two squares long and one square to the side, the rook can only move in a straight line vertically or horizontally, and bishops can move diagonally on the board. One of the most focused team strategy games is contract bridge. This card game consists of two teams of two players, whose offensive and defensive skills are continually in flux as the game's dynamic progresses. Some argue that the benefits of playing this team strategy card game extend to those skills and strategies used in business and that the playing of these games helps to automate strategic awareness. This type of game is an attempt to simulate the decisions and processes inherent to some real-world situation. Most of the rules are chosen to reflect what the real-world consequences would be of each player's actions and decisions. Abstract games cannot be completely divided from simulations and so games can be thought of as existing on a continuum of almost pure abstraction (like Abalone) to almost pure simulation (like Diceball! or Strat-o-Matic Baseball). 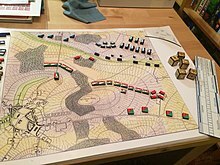 Wargames are simulations of military battles, campaigns or entire wars. Players will have to consider situations that are analogous to the situations faced by leaders of historical battles. As such, wargames are usually heavy on simulation elements, and while they are all "strategy games", they can also be "strategic" or "tactical" in the military jargon sense. Its creator, H. G. Wells, stated how "much better is this amiable miniature [war] than the real thing". One of today's modern games that has become a sensation for its strategy and tactics is the XCOM franchise, specifically the two most recent games, XCOM: Enemy Unknown (2012) and XCOM 2 (2016). These two games portray the player as a commander of an international organization known as XCOM. The player's job is to repel an alien force using the recourses that you are given by each region and country that is a part of the organization. The game is played through confrontations with the alien force using a squad of four to six soldiers with periods of time in between where the player is able to even the odds placed against them by upgrading weapons and armor for the soldiers using technology that is recovered from the aliens. These upgrades result in boosted health as well as laser- and plasma-based weapons and are necessary to achieve if the player wishes to complete the game. Like chess the games have different classes of soldiers with different abilities which can turn the tide of the game if you use them correctly or not. They come in six classes for each game. In XCOM: Enemy Unknown the soldier classes consist of heavy, capable of dealing heavy damage and carrying rockets as well as grenades; the sniper, capable of hitting enemies from beyond line of sight and doing immense amounts of damage with a single shot; the support, can heal teammates and provide cover using smoke; the assault, which relies on getting up close in order to use the shotgun that they use to make short work of any enemy; the Psionic, this class specializes in applying status effects and generally messing with the opponent's force; and finally the MEC, this used to be a fully organic being but volunteered to replace their organic body with robotic augments, this gives them massive amounts of health and makes them the tanks of the game on the protagonists side. Another aspect of turn-based strategy rather than just a battlefield in modern video games is controlling countries such as in the Civilization franchise and their most recent title, Civilization VI. This strategy game forces the player to look at the world as a whole as there are multiple countries involved in the game that will react to the player and their actions and how they influence the world. The player must maintain relations with other nations as they try to progress their society forward by the inclusion of funding to sections of their society such as mathematics, art, science, and agriculture. Each of these is important to maintain as the player progresses because without the added funds to these branches of society most players will be stuck in the Dark Ages while other civilizations advance into renaissance eras and further. This can cause turmoil in the player's civilization as well as revolt and will bring the civilization crumbling to the ground. This is only a small portion of the game, the other nations around the player will offer treaties and alliances but some of these are shams and are used to lure the player into a false sense of security as an allied nation begins to take over resources or land that used to belong to the player. In these situations it becomes tricky to navigate as there are two paths, negotiation or war. Negotiations are often the best choice because it avoids conflict and allows your society to progress further whereas war takes a considerable amount of resources and the player must also be aware of the actual allies that the opposing force has and how much aid they will provide. Unfortunately negotiations are not always possible and it can result in war, this makes it very important to have loyal allies of your own and a suitable army with sufficient technologies which is all supported by your societies math and science departments respectively. ^ "11 Ancient Board Games". 2016-03-01. Retrieved 2017-04-10. ^ (MisterCutie), Matthew. "The History of Chess: The Basics". Chess.com. Retrieved 2017-04-10. ^ Adams, Jenny (2011). Power Play: The Literature and Politics of Chess in the Late Middle Ages. University of Pennsylvania Press. ISBN 9780812201048. ^ Rundle, Michael (2013-04-09). "How H. G. Wells Invented Modern War Games 100 Years Ago". The Huffington Post. ^ "Strategy Games". Apple. Retrieved 2008-12-28. ^ a b "XCOM: Enemy Unknown Wiki Guide - IGN". IGN. Retrieved 2017-04-10. ^ Stapleton, Dan (2016-02-01). "XCOM 2 Review". IGN. Retrieved 2017-04-10. ^ "Civilization 6 review – The best in the series to date". TrustedReviews. Retrieved 2017-04-10. ^ a b c "Civilization 6 Wiki Guide - IGN". IGN. Retrieved 2017-04-10.